I admit I was fairly certain that I was going to enjoy this one before I even opened the book…the author’s R.J. Scott and for me that pretty well makes it a done deal. For me Luke was the perfect person for Derek. He saw past Derek’s exterior with his pretense of confidence in an effort to cover his insecurities. Luke saw a talented man that he knew he could both like and respect. For Derek, Luke was his dream man come to life. One of the things about this story that really capture my attention was the relationship dynamics between Derek and his parents. So often in stories the relationship between adult children and their parents are portrayed as either being good or not good but for Derek and his parents that’s not the case. Derek loves his parents and they love him and are supportive of him, but Derek doesn’t see it this way and that’s largely due to a communication issue or more accurately a case of miscommunication. Which for Derek is a more common event in his life than it needs to be because of the defensive barrier he’s built around himself. Sean Crisden was the narrator for this story, so along with revisiting a story I liked by an author I really like. I get to listen to one of my favorite narrators read said story. Sean Crisden is one of those narrators whose voice has this laid back tone to it that just draws me into a story allowing me to relax and just enjoy what I'm listening to. For me the whole choice of what audio narrators a person likes is such a personal and subjective issue because it's not just a matter of the narrator it's also about the right narrator for the right book and when it came to this book, I'm not saying that another narrator couldn't have also done a good job but I am saying that for me...Sean Crisden did an excellent job in capturing the characters and the spirit of the holiday season contained within the pages of this story. 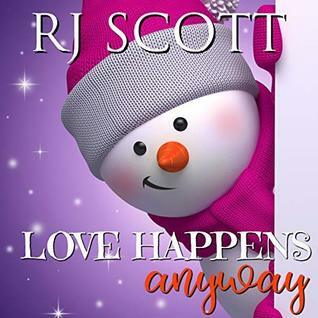 An audio book of 'Love Happens Anyway' was graciously provided by Signal Boost Promo in exchange for an honest review.